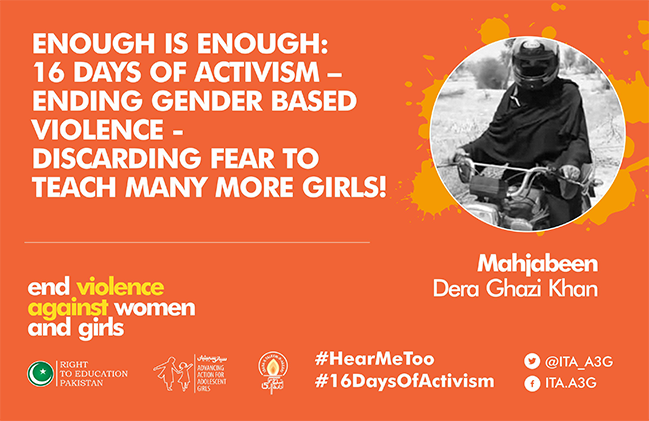 Enough is Enough: 16 Days of Activism – ending Gender Based Violence - Discarding Fear to Teach Many More Girls! Saluting-Mahjabeen today, a 33 year old female teacher who commutes on a motorbike daily to teach her students in DG Khan South Punjab, Pakistan. She has Broken ALL Boundaries for her passion to teach! These subaltern stories reaffirm our confidence in the art of the possible! For Mahjabeen Burqa gives her protection, as she dons it before before accelerating her journey on a motorbike that approximately covers 26 kilometers for her to reach Government Primary School No 2 located in Basti Kalairi from home. The school is located in Koh Suleiman area, while Mahjabeen resides in Sokar in the Taunsa Tehsil. Mahjabeen is a graduate from Bahauddin Zakariya University, Multan. She holds master’s degrees in Political Science and Education. The courageous lady has no fear of security while riding through deserted areas of the town. “I pass through a route that was once infested with terrorists to reach the school,” she says adding that some terrorists were killed in a raid by Rangers last year but the thought of their presence still haunts the area.